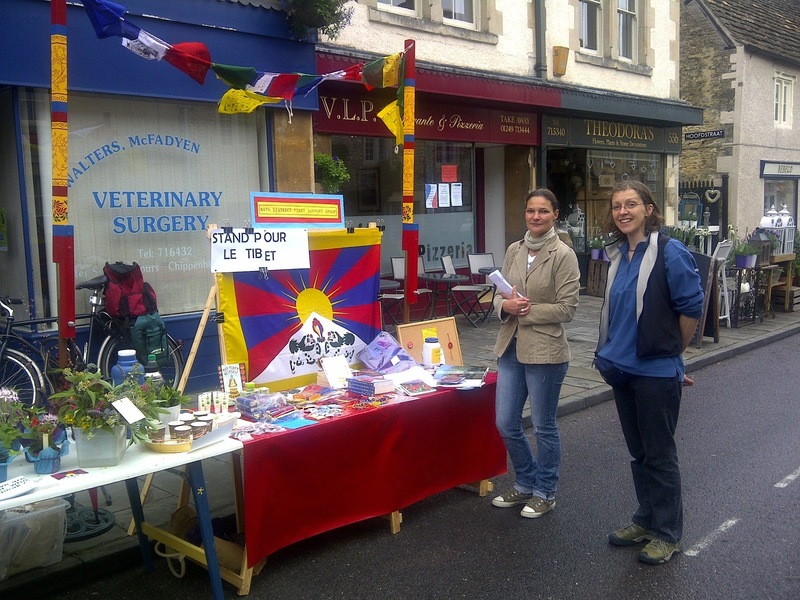 Here are a few images from Saturdays Stall at the French Market in Corsham where we made £109.87. We had lots of interest including the local MP Duncan Hames who dropped by to report that he had signed EDM 1434 Arrests in Tibet. A total of 43 signatures were collected for the petition for Dhondup Wangchen - you can see his Film 'Leaving Fear Behind' at leaving-fear-behind-dondup-wangchen for which he got a six year prison term and was not allowed to present a defense at his trial. The new Tibetan themed flag poles were widely admired. Tibet was an ancient country the size of western Europe when it was invaded by the People’s Liberation Army of China in 1950. A place with a unique culture, history and identity, Tibet has been changed dramatically by the Chinese invasion and occupation. Not only have many Tibetan lives been lost, Tibetans in Tibet do not enjoy basic human rights and the Chinese government have introduced policies by which Tibetan culture, language and natural resources are being systematically and irrevocably eroded. This site is dedicated to His Holiness the 14th Dalai Lama, the heart and soul of the Tibetan nation.